Prices for this 4 bedroom villa start at£78 per day minimum stay 3 nights. This pretty stone villa is located on the beach in the pretty seaside villa of Racisce on the island of Korcula. Newly renovated, the house offers guests comfortable accommodation with a beautiful pebble beach located directly in front of the property ideal for families with young children. The villa consists of a ground floor entrance with stairs to the first floor where there is a comfortable open plan kitchen/diner/lounge area with windows looking out to sea. There is also a bathroom and private courtyard with (gas) BBQ located on this level. The second floor features two double bedrooms both with sea views and a twin room. There is also a second bathroom located on this floor. The third floor is an open plan loft with sloping ceilings and features one double bed and one single bed. The lounge area on this level features doors leading out onto a terrace offering panoramic views of the sea and village. The terrace also contains a table which can seat up to 8 persons. The village of Racisce has a grocery store, a pizzeria and a restaurant specializing in Dalmatian cuisine. There is also a hotel that is open all year round within 3 mins walk that features a restaurant and bar. A further 4 restaurants are within 5 minutes drive of the villa. Fresh vegetables and fruit can be purchased from the village daily and fish twice a week. Furniture for the beach (recliners, parasols) are provided by the owner. 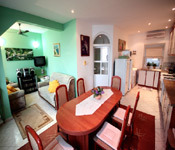 The villa provides ideal accommodation for families or a group. Vaja bay nearby is a beautiful quiet inlet ideal for snorkeling and diving (access is via a stony pathway not ideal for young children or people experiencing walking difficulties). Day excursions to Dubrovnik can be arranged from Korcula town 25 minutes drive away from the villa. A cook is available to prepare breakfast, lunch and dinner, prices listed below. Other services available at the property include welcome pack with bare essentials available upon the arrival and babysitting. A boat trip for up to 10 people can be organised that collects guests from just outside the villa. Prices for such services available on request, please speak with one of our staff for details. Minimum stay: 7 nights in July/August or 3 nights other months. Arrival Days: Usually Saturday in July/August. Other dates on request. Rooms which have air-conditioning : Lounge is air-conditioned. Parking Comments: Parking is off-street. Internet Comment: Wireless Wi-Fi connection. Additional Appliances : Electric Wok, breadmaker, coffee percolator, citrus juicer, waffle-maker. Other rooms: Courtyard with BBQ and table. Furniture in terrace/balcony/garden: Terrace with table seating up to 8 persons. Indoor dining table can seat up to 10 persons. There is a fridge kept on this level to store drinks. 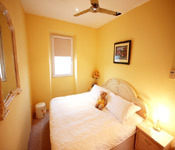 Additional Information on rooms: Top floor loft bedroom has 1 single bed and 1 double bed. Others :Baby-sitting also available. Fee on request. 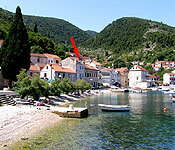 Distance to airport: 2 hrs 30mins to Dubrovnik airport. Frequency of Buses: 5 times per day to Korcula. Details on nearest shops: Grocery shop in village. Restaurant with in walking distance: Yes, 50m away. Others:A boat trip can be organised that collects guests from near the villa. 100 Euros a day for the whole boat (includes lunch and some drinks). A baby-sitting service can also be organised, prices on request. Separate charges which are usually paid for locally Cooked breakfast available at Euros 8 per person per day. Three course meal available from a set menu at Euros 20 per person per day. Excludes beverages. All meals payable locally. The following must be produced on arrival in cash:300 euros. 1, MAPS-Click on maps to enlarge To view Google Map click here.